You can now search Uptown at the street level on Google. 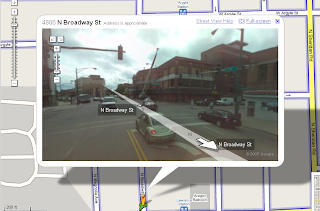 Simply type in an address and click on "Street View." It's fun to zip up and down the neighborhood streets--I think I even spotted a few people I know! I was even able to find a disturbingly detailed image of the six-flat I live in--you can practically see inside the windows. Go to www.Maps.Google.com to try it out yourself.